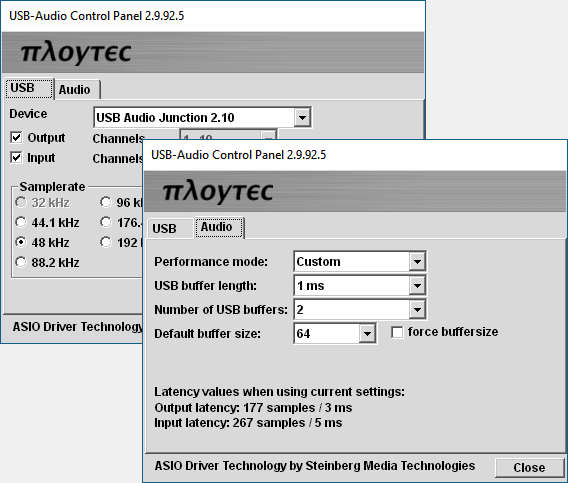 Ploytec's Windows USB Audio driver and Mac OS X USB Audio HAL-plugin driver enable buffersizes down to 32 samples (0.73 ms) and create an ultra highspeed USB audio connection, bypassing the operating system's audio, its mixing and samplerate conversion. This not only gives you low latencies, but better sound quality also. Using ASIO / HAL plugin it's possible to do direct "one to one" hardware connections and even use higher bitrates, if supported by the device. The driver is available for licensing. It supports almost any USB Audio platform. Licensing is negotiable, typically there's a setup fee and a royalty. For low quantity projects, it's possible to purchase JCT2 chips, including the driver license, in multiples of 270 pieces only. Please contact us regarding licensing, support and further information. We offer a commercial version of the USB audio driver supporting a number of different devices available at the online shop. Please download the demo. The MixPre-10T is the newest member of the groundbreaking MixPre Series of recorders, mixers, and USB audio interfaces. This lightweight, 10-input/12-track recorder offers world-class sound quality, flexible powering, and built-in, highly accurate timecode generator/reader – perfect for production sound mixers, field recordists and sound designers. Reloop is proud to introduce KUT, a digital 2-channel battle mixer, which impresses with its classic design and modern features. The development of this mixer was focused on the art of turntablism and scratching. With the integrated audio interface, with excellent sound quality in 24-bit/96 kHz, even the combined master output can be recorded via USB. Experience a whole new way of intelligent audio mixing. Intellimix is designed to simplify your daily work and stimulate your creativity. Be it media, audio production or video, you will discover amazing features. SPL Crimson 3 - an award winning Audio Interface with Analog Monitoring, Phonitor Matrix and Talkback Microphone. U168 XT is a USB 2.0 Hi-Speed audio interface for Mac and PC, bringing USB audio technology to a new level by providing better performance for better results. This interfaces provides not less than 16 input channels and 8 output channels that are all available for simultaneous usage.